One of the most surprising stories in 2015 so far is the sudden emergence of a new Alien Sequel from director Neill Blomkamp, which original Alien director Ridley Scott will produce for 20th Century Fox. The filmmaker has largely stayed away from developing projects with major studios, after he was supposed to direct a big-budget adaptation of Halo for producer Peter Jackson and 20th Century Fox. The project ultimately fell apart over creative differences with the studio, leading Neill Blomkamp to develop his first feature District 9 on his own, which would go on to earn a Best Picture nomination. He went on to direct two more sci-fi adventures, Elysium and Chappie, although he turned down several opportunities to board big-budget franchises as well, that is, until this Alien Sequel. 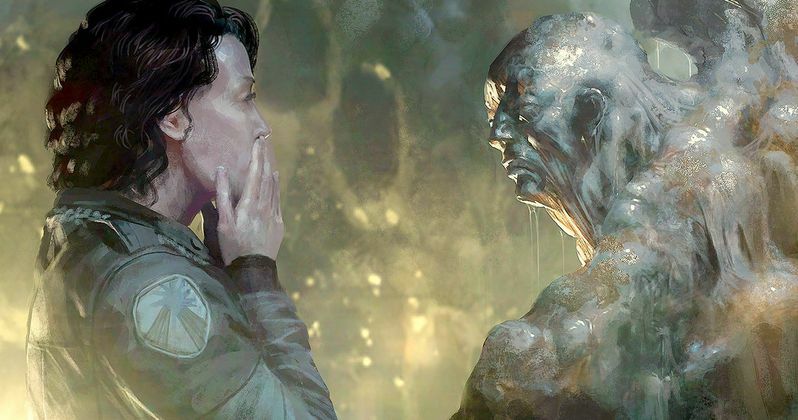 Entertainment Weekly recently spoke with Neill Blomkamp about how his Alien movie came about. While the director reveals that this idea had been percolating in his mind for several years, it wasn't until he started working with Sigourney Weaver on Chappie that the project really started to take shape. Here's what he had to say, when asked if working with the actress served as a catalyst. "It did have to do with having Sigourney on Chappie. It's just something that I've always wanted to one day be a part of. Those first two [Alien] films are probably my favorite films ever made. I didn't know if it would ever happen. I just always wanted to participate in it if I was able to. Over the years, I came up with a story for a film in that universe that I wanted to make. And then when I talked to her about her experience making those films and what she thought about Ripley and everything else, it informed and changed the film I wanted to make into something different. It just sort of stuck with me. A year later, when post-production was winding down on Chappie, I started fleshing out the idea for a film that would contain Sigourney. Fox never knew. I just worked on it when I could. Before I knew it, I had this really awesome film with a lot of artwork and a lot of backstory. And then I didn't know whether I was going to make it or not. So I just kind of sat on it for a while." When asked if 20th Century Fox "sat on it" after he showed them his treatment, the director added that the studio was on board right away, but that he sat on it to make sure it was the right choice for him. "No, Fox was keen from the moment I showed it to them. They didn't even know I was working on it. I just wanted to make sure that-any big studio film, I want to know that it's the right choice for me. So I just kind of sat on it for a while." Unfortunately, the director wouldn't shed any light on the story, and he wouldn't confirm last week's report that the plot is reportedly set after Ridley Scott's upcoming sequel Prometheus 2, which is set for release on March 4, 2016. The filmmaker wouldn't even confirm if he has a treatment written up, or if he has started work on the screenplay. Of course, the project is still in very early stages, but hopefully we learn much more about this highly-anticipated film very soon.